Known as the “Brand of the Brave”, Five Ten has earned this moniker through a proven record of creating performance footwear the fuels the passions of those who feel at home in the great outdoors. As a leader in high-friction footwear, Five Ten develops the kind of shoes you are glad to find on your feet while doing everything from rock climbing to mountain biking to kayaking. Cutting edge designs and world-class innovative approaches make Five Ten the top shoe brand for exciting athletes across the globe. Charles Cole was climbing solo when he encountered a particularly harrowing mishap on his descent. By the time he had made his way to safety, Cole had already formed the plan to start Five Ten. His experiences made him realize the importance of having a high-performance hunk of footwear for climbing that is truly dedicated to traction. Now, nearly 30 years later, Five Ten is thriving out of Redlands, California as an absolute authority within the industry. The name Five Ten is derived from the decimal system used to technically rate the difficulty of climbing routes. Since Five Ten has a rich history engrained on rock faces and crags, it makes perfect sense that they would be poised on top of a pile of accolades for their impressive climbing shoes. Leading the charge are the Five Ten Anasazi Arrowhead shoes. A casual down-turn in the toe and heel deliver all the grip and none of the pinch. The upper segment is crafted from supple Cowdura material for a breathable experience like no other. High-friction Mystique rubber and an Onyxx outsole set the standard for edging capabilities, and the entire thing molds to your foot for more comfort than you ever thought possible from a climbing shoe. 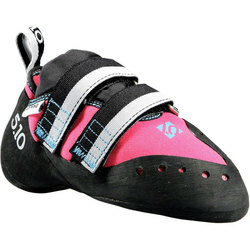 But that is just how Five Ten does climbing shoes, and the Anasazi Arrowhead is all the proof you’ll need. Commitment to traction doesn’t just stop at climbing shoes with Five Ten. The fact is, they have developed numerous lines of kicks to dominate all terrain in multi-sport fashion. The Five Ten Women’s Guide Tennie is a prime example of the kind of footwear that can tackle various activities all in one outing. Slip these bad boys on and you will have no problem hiking 20 miles, scrambling across boulder fields and then climbing some less technical routes. Inside the Guide Tennies you will notice a rockered profile that leads to a healthier stride. The specially designed outsole and midsole regulate flexibility and crank up stability so that you can take on whatever adventure comes your way. As the world’s most popular approach shoe, the Five Ten Guide Tennie Hiking Shoe is a prime pick for variable conditions and terrain. The soles are just so ridiculously amazing that sponsored climbers will secretly resole their shoes with Five Ten’s Stealth rubber, because they know that nothing else can compare. Join up with the Brand of the Brave, and make Five Ten your trustworthy outdoor ally.